Would you like to see and hear some very talented local people perform? Want to find out more about the Murrieta Arts Council? Or do you just want some good coffee and snacks? You can have it all! 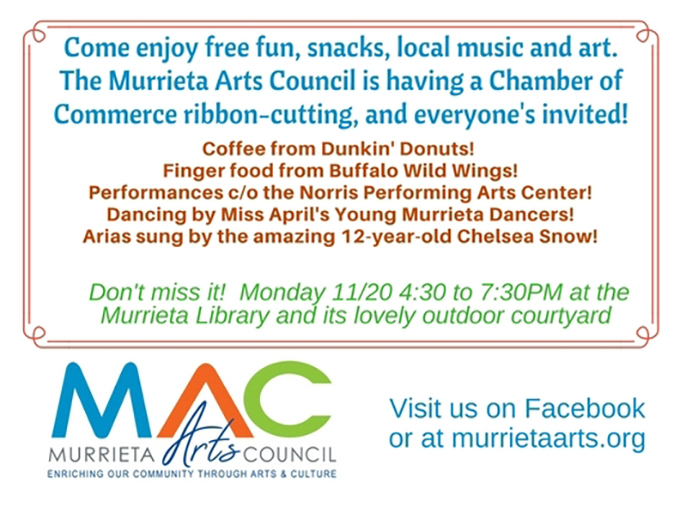 Don't miss the Murrieta Arts Council's second anniversary Chamber of Commerce ribbon-cutting. It is Monday, Nov. 20 from 4:30-7:30 p.m. at the Murrieta Library and its lovely outdoor courtyard. For more information about the Murrieta Arts Council (MAC), visit murrietaarts.org or its Facebook page.